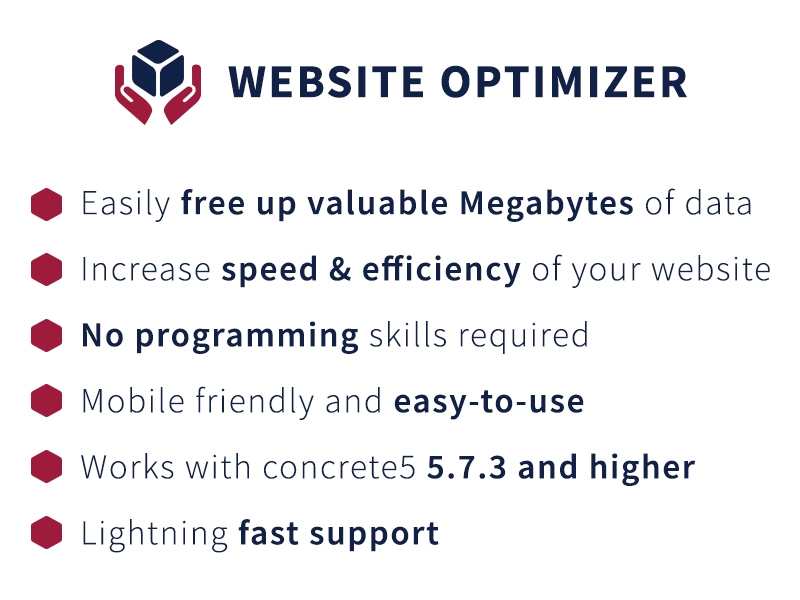 Website Optimizer is the perfect tool for cleaning your concrete5 database and files/directories, to let your website run at maximum efficiency. This tool will sum everything up for you, you can check some checkboxes and let it do its thing. It’s up to you to optimize bits and pieces, we don’t force anything nor automate anything. YOU are in control here. So free up valuable Megabytes (MBs) worth of data on both your FTP/hard disk and your database. Keep your website clean and start optimizing. Increase the speed and efficiency of your website! Do not forget to make backups of both database and files every time BEFORE you start optimizing though. That will save you trouble, in case you accidentally removed a trashed page you want to retrieve or an inactive user or things alike. Dashboard – System & Settings – Optimization – Website Optimizer. Or use the “Search” box in the toolbar and type in “Website Optimizer”. This Add-On, nor the creator, can be held responsible for damages or loss after optimizing YOUR website. It is you who chooses to optimize the website, so act carefully.